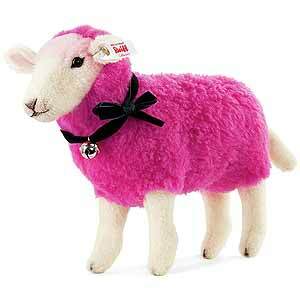 Pinky Lamb by Steiff. From the designers choice series, this beautiful hand made piece, in pink wool plush, is non jointed and wears the white ear tag, signifying this item as a Steiff limited edition, together with the famous gold plated Button in Ear. Limited edition of only 500 pieces worldwide. Product details: safety eyes, synthetic filling material, non growler, size 25cm. Comes boxed, together with a numbered certificate of authenticity. "I like you!" Our little lamb, with a pink coloured woollen coat that would love to conquer your heart and win you over to the new Steiff series "Designer´s choice". The idea: our designers create new classics by freely changing life-like animals, whilst remaining faithful to the traditional standards. Thus new collector items are created, in exclusively small editions. Pinky, as the first representative of "Designer´s Choice", sets the tone in impressive style. Made of pure wool plush and manufactured from high quality pure wool, the little sheep is wearing a black velvet ribbon with a bell, and a gold-plated "Button in Ear". It´s expressive and endearingly shaped head and trusting look make it easy to take Pinky into your heart.